Sometimes they just come out so cute. and made of knit so he is on the chubby side. Can you believe it? Two different cute little squirrel prints, perfect for my kitties! Or maybe they are chipmunks, now that I am looking again? Close enough, right? She has a cashmere sweater and the last little bit of a spider-webby lace shawl that I’ve been cutting up for years now. Squirrels and more squirrels! And she has a pale yellow cashmere sweater and a silk bow. I will call her a school girl kitty because she has a backpack. She is a fancy girl, ready to go out for the night. I know, you aren’t suppose to let the kitties go out at night, but she is certainly prepared! Do you see that trim around the neck of the sweater? It is some very old trim that I had in my stash and was just the perfect accent. I wonder about that “Dust Proof” claim. 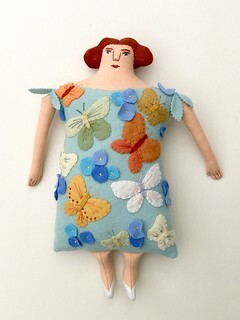 She has a lovely evening bag to go with her outfit. 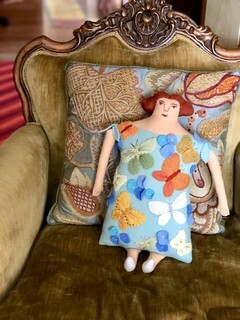 This dress is made from a Liberty print but the fabric is quilting weight cotton versus lawn so the drape is different. I love this dress fabric- perfect for an adventurous kitty girl! She has a cashmere sweater and scarf too. This kitty girl is all the NOT WINTER colors- so tropical and cheerful! It is looking very winter-y here in the Boston area. Pretty but messy. First is the another thing. CraftBoston Holiday is what I have been focused on and working towards. I will be setting up this coming Wednesday and the show opens on Thursday evening. The link will take you to a page with a discount code for entry. Come and visit if you can! And now a Black and White friend for the girl kitty of yesterday. And yes, we did have snow.